The first Europeans to visit the Bonners Ferry area were with trapper/explorer David Thompson in 1808. Thompson was a cartographer and fur trader in the employ of the Northwest Trading Company. In 1809, Thompson established a trading post further south at Lake Pend Oreille and did a brisk business with the Lower Kootenais for many years. In 1846, Father DeSmet, a Jesuit missionary arrived in the area, coming at the invitation of the Kootenais. The boundary between the United States and British Canada was established in 1846 but wasn't surveyed until 1858. In 1864, Edwin Bonner established a ferry crossing of the Kootenai River where the city of Bonners Ferry is now located. Back in those days, miners were traveling north on the Wildhorse Trail to reach the gold fields in British Columbia. Bonner leased the business to Richard Fry in 1875 but Bonner's name has stuck. The area really began to flourish in the 1880's, after the steamer Midge began service on the Kootenai River, carrying passengers and freight between Bonners Ferry and British Columbia. The steamer ran for 25 years. The Great Northern Railway arrived in 1892, followed by the Kootenai Valley and Spokane International Railroads. 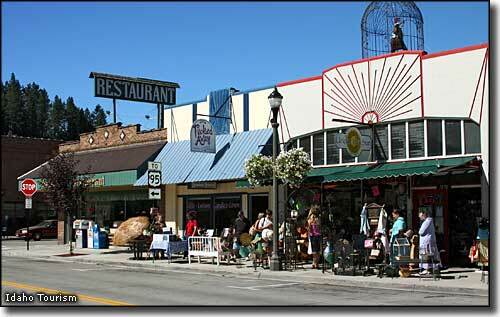 The actual town of Bonners Ferry grew up beside the Great Northern railroad siding, beginning in 1893. There were a few mines in the surrounding mountains and farms and ranches stretched north, south and east along the river valleys but the big business was lumber. The Bonners Ferry Lumber Company grew to become one of the world's largest lumber mills before business dropped off in the 1980's and 1990's. The local Kootenai Tribe never was at war with the United States Government and never signed a peace treaty. Because of that they were never granted a reservation. In 1975, the tribe, led by Chairwoman Amy Trice, declared war on the United States and positioned "soldiers" at each end of Bonners Ferry, stopping vehicles and collecting tolls to allow people to drive through what had been their aboriginal land. Shortly after that, the tribe was recognized by the feds and granted a 10.5-acre reservation, ending the "war." The famous Ruby Ridge is about eight miles from Bonners Ferry. Upper photo courtesy of the Idaho Department of Tourism.